Mick Newell - Notts County Cricket Club director of cricket. Tom Moores has signed a two-year professional contract with Nottinghamshire, committing him to the club until the conclusion of the 2018 season. Moores has enjoyed a breakthrough season in 2016, playing 13 matches across the three formats on loan with Lancashire, before returning to claim a place in the first team at Trent Bridge, scoring 41 on his Nottinghamshire debut in Scarborough. “This is a huge reward for me,” Moores said. “Having come through the academy, and just tried to perform wherever I’ve had the chance, I never considered myself working for a contract. “I’ve just been keen to take every opportunity I can, and I’m over the moon to be a Nottinghamshire player. “It has felt like a summer of highlights, from making my Notts debut, to playing in big matches for Lancashire, and really enjoying my cricket in the second team. As well as the opportunity to keep wicket to James Anderson and face Ben Stokes in a red ball fixture at Southport, Moores’ loan spell at Lancashire yielded a man of the match performance against the Birmingham Bears in the NatWest T20 Blast. The match at Emirates Old Trafford in July saw the wicketkeeper/batsman score 39 off 32 balls in a low-scoring contest, as well as holding two catches behind the stumps. “It’s important for us to keep our best young players and to develop them into the best players they can be, for club and hopefully for country as well,” said Nottinghamshire director of cricket Mick Newell. “Tom has looked very calm and positive at the crease, in the field and around the first team squad. The left-hander also helped himself to 349 runs in two Nottinghamshire Second XI matches against a Durham line-up that included England fast bowler Mark Wood, leading to selection for the first team. The 2016 season has also seen Moores make two appearances for England’s U19s, scoring 70 off 68 balls at the top of the order against Sri Lanka at Chelmsford. “Going out on loan did Tom a lot of good,” added Newell. 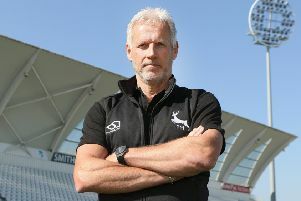 “It’s given him confidence that he can play at first team level – either as a wicketkeeper or a specialist batsman – and he’s brought that back to Notts. “It’s been good to see that he hasn’t changed his game from what was working for him in the second team.